The additional settings--Common Module, Restrict Access and Activity Completion--in every activity, resource and topic section are versatile tools to restrict access of the course content to just those particular users on the site who should access them. The Common Module is also known as Groups and Groupings. This feature provides the ability to further organize your users into distinct groups, allowing you to control the content they see within the LMS or a specific course. 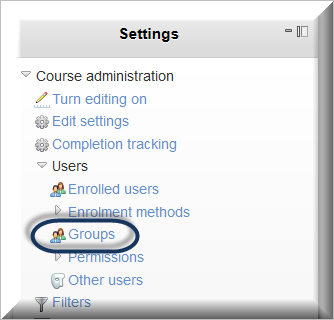 Groups and Groupings will also provide the option to report on a specific group of users in a given course. Now you can create Groups and Groupings in a course. Note that students must be in a Group in order to be in a Grouping. On the groups screen, click on Create group. Give the group a name and save changes. Ensure the group name is highlighted on the left and click on Add/remove users. Click on users’ names and then on the Add button. You can use Shift or Control plus click to add several users at one time. Click on Back to groups. Repeat as needed to create all desired groups. On the groupings page, click on the people icon that represents groups, found to the right of the grouping name. Click on one or more groups to add to the grouping. Click on Back to groupings. 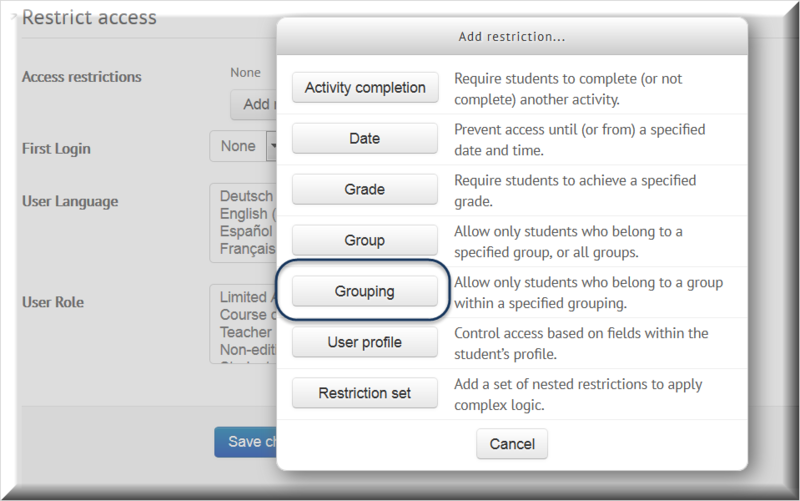 You can add more groups to the grouping or more students to the groups at a later time. When a user in any other grouping logs in, they will not see any meetings in the course. The My Meetings tag on the front page will not respect restricting meetings by groupings. If you use groupings for meetings, do not use the My Meetings tag. In RT3, the location of the grouping restriction for topic summaries is found in the Restrict Access settings for the topic (see next section). 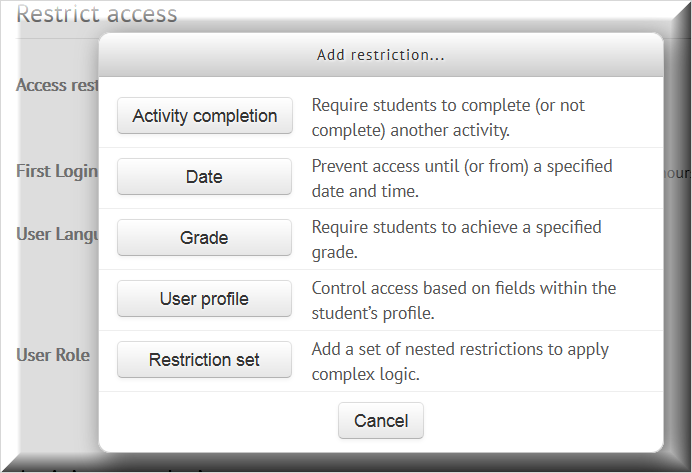 Restrict Access is a Moodle feature that replaces the “locking” feature in the earlier versions of the RT platform. This feature is used to prevent users from accessing an Activity until they have completed another component of the course. 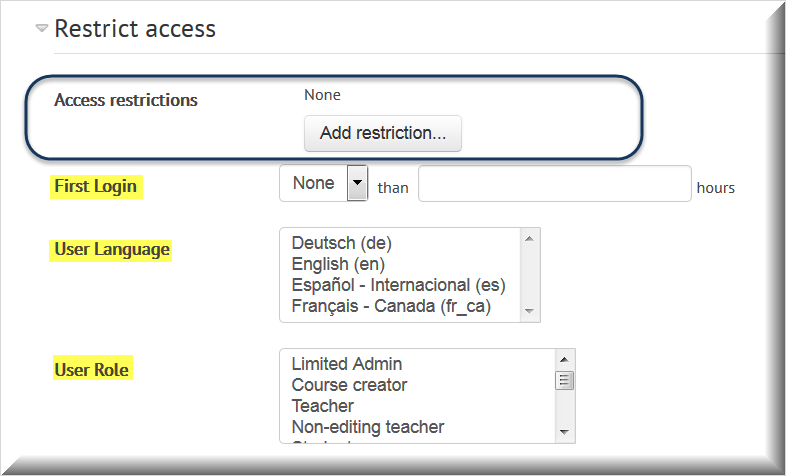 Refined Training has added three more conditions to the existing Moodle Restrict Access options. The options highlighted in yellow above are the Refined Training options, described below. Activity Completion – prior activity that must be marked complete before student can access the current activity or section; this can include activities for which no grades are given. The prior activity must have its activity completion set first (see Activity Completion below). The choices for Activity Completion are Must be marked complete, must not be marked complete, must be complete with pass grade and must be complete with fail grade. You can enable the equal to or greater than option, the equal to or less than option or both to set a grade range. New in RT3, you can use 100% as the required equal to or less than grade condition for a prior activity. You can also set grade conditions for more than one prior activity. User Profile - access to activities based on any user profile field, selected from a drop-down menu and refine the access by is equal to, contains, doesn't contain, starts with, ends with, is empty or is not empty. Restriction set - you can a set of nested restrictions to apply complex logic. If open, the activity will show activity greyed out, with restriction information displayed; if closed, the activity will be hidden entirely. The wording in this message can be edited by going to Language>>> Language customisation>>> mod_connect and searching for the string connect_grades_notyet. In RT3, the Retry link is a default language string; for sites running earlier versions, see Prerequisite Refresh Link for how to set this. The RT custom restrictions can be used in addition to Moodle restrictions. This option is typically used on the front page of the site to welcome users in their selected language and to direct them to courses offered in their language. But it can be used in courses, too. These Refined options can be used alone or in combination with any of the other options. For example, you can use a combination of these options to make sure that new users whose language is French and who have the role of Editing Teacher see a message that other users on the site do not see. When you set Restrict Access conditions on a topic section, everything in the topic section will be restricted, including any resource or activity in the topic. When you set Restrict Access conditions for an activity or resource, only that activity or resource will be restricted; everything else in the topic will be accessible by all users. It is, however, possible to restrict a topic section by language and then to restrict the PDFs uploaded to that topic section to various roles, such as Editing Teacher or Advanced Students. If enabled, Activity completion is tracked, either manually or automatically, based on set conditions. Multiple conditions may be set if desired. If so, the activity will only be considered complete when ALL conditions are met. Completion tracking – If using this feature, select one of the following: Students can manually mark the activity as completed or Show activity as complete when conditions are met; otherwise leave at Do not indicate activity completion (the default option). Require view – student need only click on the activity or resource to complete the activity. Require grade – students must get any grade to complete the activity (pass or fail). Expect completed on – date by which your users are expected to complete the activity. Click on Save and return to course. When Student must receive a grade to complete this activity is selected for Connect Activities, the course Reports may not register the completion until one or two cron runs have taken place (cron runs occur approximately every 15 minutes). Once the completion is reported for the Connect Activity, any other activity with a restrict access dependent upon it will unlock. You may need to post a notice in the second activity to inform students to wait for a half hour. Flexible Certificate/Completion report generates reports based upon the completion status of users in courses that have completion criteria set. Course Assignment Tool allows an administrator to change the status of users to/from complete in courses with completion criteria set; this is especially useful if users are likely to have registered into the wrong session of a particular course. 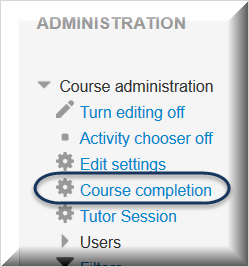 Front Page Progress Tracking displays a green progress bar on the Front Page of the LMS to indicate what percentage of the course the student has completed. To ensure your users can actually get 100% complete, you must set all activities and resources in the course with completion criteria. As a rule, we recommend that, you always set completion criteria inside the Course completion set-up (listed under Course administration). You need to set completion criteria for at least one activity to set up completion for the course; usually the certificate is the best indication of course completion.